The biggest fingerling salmon in this Alaskan fish hatchery are likely born to the biggest mothers. It's been known that for some fish species, being a bigger female means you'll have more eggs — a lot more eggs. But the surprising thing that Marshall's team found was that bigger fish produce "massively more offspring and larger offspring than smaller fish," Marshall says. As fish grew larger, female fertility grew even faster. For example, take a 60-pound fish and compare it with a 4-pound fish. It's 15 times as big. But it produces 28 times the amount of eggs as the smaller one. Marshall published the study in the journal Science. He says it's a reminder that protecting bigger females is a good way to keep fish stocks plentiful. And that catching too many big ones will deplete the overall population. "If we actually think about maintaining these big fish we can actually get far more production than we currently have now," he says. He found that this relationship between size and high fertility shows up in 95 percent of the fish species he studied. He credits Canadian biologist Tara Marshall (who is not related) of the University of Aberdeen with some of the earliest research on this phenomenon. "We're all kind of aware of it," she says of fisheries biologists. "But what's new about this paper is that it's just taking a step backward and sort of looking at it at a broader scale." Tara Marshall says people who manage fish stocks, as well as the commercial fishing industry, do appreciate the value of keeping plenty of big females in a fish population. "I think it's interesting in that it's a cross-species sweep ... they secured data for 342 species." Both researchers note that this "bigger is better" principle in reproduction could reinforce the importance of marine protected areas, where fishing is limited or banned. And where it's been shown that fish live longer and larger. When it comes to motherhood, bigger is better, at least if you're a fish. 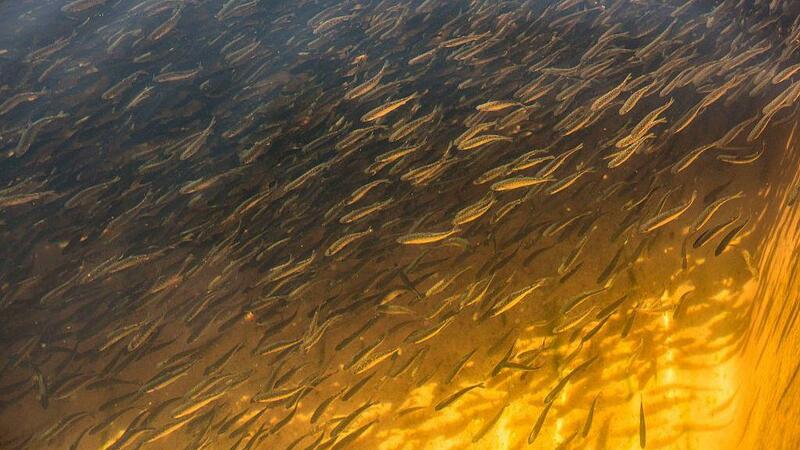 It turns out bigger fish produce more offspring than smaller ones. A group of scientists has now shown that the advantage of being big is even bigger than people had realized. As NPR's Christopher Joyce reports, the finding could help keep lots of fish in the oceans. CHRISTOPHER JOYCE, BYLINE: Scientists know that for some fish species, being a bigger female means you'll have more eggs - a lot more eggs. Biologist Dustin Marshall wondered how common that was. DUSTIN MARSHALL: So we went and gathered every bit of data we could for every fish we could find that grew in the ocean. JOYCE: About 342 species of fish. They studied how many eggs they have and how many babies, and they found something interesting. D. MARSHALL: The bigger fish produced massively more offspring and larger offspring than smaller fish. JOYCE: What was surprising to Marshall was that as fish grew larger, female fertility grew even faster. So compare a 60-pound fish, for example, with a 4-pound fish. It's 15 times as massive, but it produces 28 times the amount of eggs as the smaller one. Marshall published the study in the journal Science. He says it's a reminder that protecting bigger females is a good way to keep fish stocks plentiful and that catching too many big ones will deplete the overall population. D. MARSHALL: If we actually think about maintaining these big fish, we can actually get far more production than we currently have now. JOYCE: Marshall, who's at Monash University in Australia, says this relationship between size and high fertility shows up in 95 percent of the fish species he studied. He credits Canadian biologist Tara Marshall, who's not related, with some of the earliest research on this phenomenon. TARA MARSHALL: We're all kind of aware of it. But what's new about this paper is that it's just taking a step backward and sort of looking at it at a broader scale. JOYCE: She studies fisheries at the University of Aberdeen in Scotland. Marshall says people who manage fish stocks as well as the commercial fishing industry do appreciate the value of size in females. Both researchers note that this bigger-is-better principle in reproduction could reinforce the importance of marine protected areas. These are sort of sanctuaries for fish where fishing is limited or banned and where fish live longer and larger. Christopher Joyce, NPR News. Transcript provided by NPR, Copyright NPR.